Update 04/10/19- (NYSE: NSPR) had a small offering following our alert causing a massive short attack. The float is still approx. 1.3M shares. We are expecting some short covering soon. (NYSE: NSPR) recent reverse split 1 for 50 resulting in a current float around 800k shares. Any clinical or positive news events could send this one parabolic. We are looking for a break of the 50 DMA at $8.60/share for further confirmation. There is a fair amount of short interest that could be squeezed out here as well. Note that the stock typically has a hard time holding gains for more than a week or so. Current price at alert $7/share. 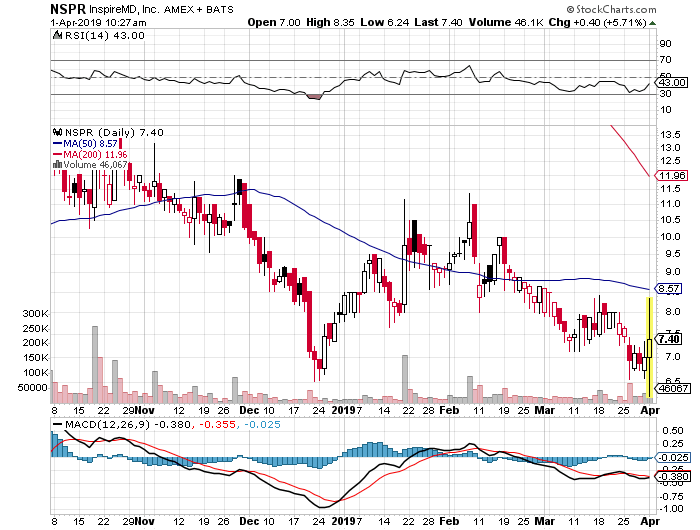 Update 4/1/19 at 3PM eastern, current price $6.30/share. Looks like a shakeout and accumulation, we would be very surprised if this doesn’t run up a bit in the next week or so. In preparing this publication, TNS LLC has relied upon information supplied by its customers, publicly available information and press releases which it believes to be reliable; however, such reliability cannot be guaranteed. TNS LLC and its parent company have not been compensated for the mention of NSPR and we do not own any form of equity in NSPR. Investors should not rely on the information contained in this website. Rather, investors should use the information contained in this website as a starting point for doing additional independent research on the featured companies. The advertisements in this website are believed to be reliable, however, TNS LLC and its owners, affiliates, subsidiaries, officers, directors, representatives and agents disclaim any liability as to the completeness or accuracy of the information contained in any advertisement and for any omissions of materials facts from such advertisement. TNS LLC is not responsible for any claims made by the companies advertised herein, nor is TNS LLC responsible for any other promotional firm, its program or its structure.